Every divorce is different. Some create much less drama & destruction than others. If the divorce involves a partner who is narcissistic or shows the traits, it can be catastrophic. This post is for those facing the changes and challenges that come with Divorcing a Narcissist. If this doesn’t pertain to you, after you’ve counted your blessings… I bet you know someone you can help by passing it along. This article illuminates a Bridge to help navigate the journey Back Home. Karyl McBride has written a guide for people trying to extract themselves from narcissistic relationships. Her book, “Will I Ever Be Free of You? 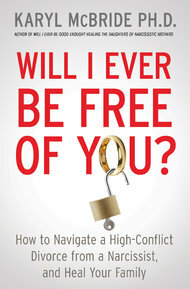 How to Navigate a High-Conflict Divorce from a Narcissist and Heal Your Family,” is featured in this month’s Well Book Club. Unfortunately, I personally know this can be a never-ending journey. They seek revenge, and the court system is an incredibly great platform for a narcissist. That’s where they can just continue the battle with the partner and continue to seek revenge, and that’s what happens. I have endured Seven LONG Years, facing law suit after law suit and have truly lost faith in our Family Court System. The narcissist will continue to try to blame their partner and harm their partner. They do it by these long, extended, contentious divorce cases that cost hundreds of thousands of dollars. We need more education for professionals in the divorce field so that the custody evaluators and family law people and therapists know what they’re dealing with. They also can be seduced by the narcissist. In the end the true victims are always the children. And my heart will forever be broken for my own children. But that’s a story for a another time.